People use these phrases all the time, often to justify their own entrenched viewpoints. We have all heard people speak passionately about something (like camp!) and then throw in the phrase, “Research says!” without actually referencing a real study. Unfortunately, research has often been used as either a crutch or a bludgeon. When it comes to research on camp, the empirical data has been shaky, at best. Until about 10 years ago, there were hardly any studies to speak of. But we have definitely turned a corner! Follow the below links to check out these amazing resources! 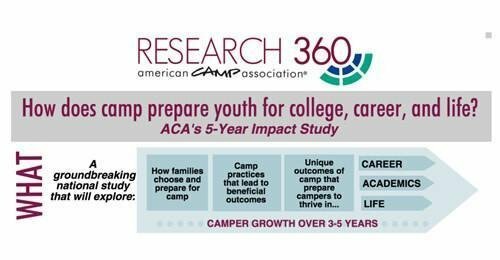 The American Camp Association’s (ACA) 2005 Directions Study set a new standard for research in the camping industry and served as the watershed for a wide variety of research initiatives. My own work on Christian camping is deeply indebted to the scholars at ACA. This should be your go-to place for research on the camping industry: ACA Research. 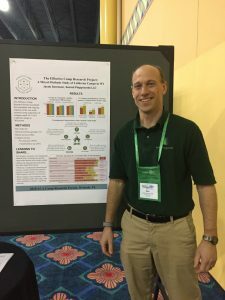 I was privileged to attend and present some of my research findings at the ACA National Conference in Orlando last week. I joined dozens of other scholars at the conference’s research forum, which has now become an annual event. I heard about projects examining such things as the impact of camp on resiliency in young girls, measuring ecological identity at camp, determining the effectiveness of online staff training, and exploring the impact of leadership training programs on career readiness. You can learn about each of these studies, along with dozens of others, at: ACA Research Symposiums. It is exciting that scholars across the country are attending to the unique characteristics and outcomes of summer camp. There is a wealth of information in the 116 research projects that have been presented at the ACA research symposiums in the past 7 years. Strangely, only 3 of these 116 presentations have attended to the unique contributions of religiously affiliated camps. One of these focused specifically on Jewish camps, and our team authored the other two about the Effective Camp project. We need more research on religious summer camps! Align your perception of camp with reality: We all think we’re doing great ministry and changing lives – research gives us a less-biased view of what is actually happening! Gain evidence to back up your words! Donors, parents, and constituents want to see evidence! Make mindful change: Rather than just trying something new to see if it makes a difference, you can make changes based on evidence after considerable deliberation. The Effective Camp Project continues! If you have not yet seen the exciting findings from the Effective Camp project, please stop reading this and go check it out! This project is now entering its fourth summer, and we will be expanding the data pool to camps in several other states and new denominations, including the United Methodist Church and Episcopal Church. We are heading to Iowa, North Dakota, New Jersey, and Colorado this summer! We are also expanding the study into Canada, with the Lutheran camps in Alberta! The Power of Camp Study! The Christian Camp and Conference Association (CCCA) is partnering with us at Sacred Playgrounds in a research initiative connected directly to the Effective Camp project. This project will help individual camps and CCCA better tell the camp story, and it will also provide a picture of the differences and similarities between Christian camps in the Mainline and Evangelical traditions. They are currently enrolling CCCA member camps: CLICK HERE if you want in! HoneyRock examines the staff experience! HoneyRock is an extension of Wheaton College and has served as a pioneer in camp leadership training. Their research team is now conducting an exciting study examining growth in summer staff members on multiple outcomes. They are focusing specifically on Christian camps connected with CCCA. Stay tuned for details on these exciting studies. But don’t stop there. Participate in the research! Sign up for the Effective Camp project or let us know about your interest in other research initiatives. Read the research findings. Apply these to your specific context. Spread the word! Together, we can tell the story about what God is up to in our camping ministries!